About the Book: A murder and a theft have been committed at Rudhall Manor. A box of jewels has vanished and Lord Sedley, a lusty old aristocrat, has been stabbed six times in the chest. About the Author: Anya Wylde lives in Ireland along with her husband and a fat French poodle (now on a diet). She can cook a mean curry, and her idea of exercise is occasionally stretching her toes. She holds a degree in English literature and adores reading and writing. Giveaway: Leave a comment by noon eastern on Monday, June 23rd for the chance to win an e-copy of Murder at Rudhall Manor. "I will be good, Miss Summer. I truly will." Miss Summer pushed the list away. "Will you?" she asked sceptically. "Or rather, can you be good for an extended period, Miss Trotter? I suppose I cannot tie you to the chair you are currently warming and keep you here forever …." Lucy nervously shook her head. "It won't be easy," Miss Summer warned. "The world is full of dangers," Lucy agreed. "I will be careful." "It won't be easy," Miss Summer repeated firmly, "for the world to adjust to your presence. England will have to shift around, make space, adapt a little, stand on its toe nails and stay alert to able to absorb someone like you … It may happen … Miracles are not unheard off." Lucy fixed her eye on a white speck on the table. Miss Summer rummaged around in her desk drawer. "Your mother's sister regretted the fact that she couldn't take you in after your parents died in the fire, but she had eleven grimy ones of her own. Here." She handed a deep red pouch to Lucy, "She left you some money. She wanted me to give it you when you were old enough. I would have preferred waiting a little longer before giving it to you, but age seems to define wisdom for some fools." Lucy jingled the pouch. It wasn't much but at least it was something. "It may be enough to buy you a dress," Miss Summer said jerking a round dimpled chin towards the pouch. "Now, for the last time, Miss Lucy Anne Trotter, are you certain you want to go to Blackwell and take care of the children in Rudhall Manor?" "I won't change my mind, Miss Summer." "Well, then, that is that." "You will not be allowed back once you leave, Miss Trotter. You are aware we have responsibilities, many mouths to feed—"
"I see … This is goodbye then." "Yes," Lucy said in a voice thick with emotion. "Goodbye, Miss Summer." She paused near the door and looked back at her beloved teacher. "And, Miss Summer …"
"Thank you … for everything." "You are welcome, child. Now repay me by behaving like a well-mannered young lady for the rest of your life." "I shall try my best, Miss Summer." "For Lord Sedley's sake, I truly hope so." Lucy nodded and left the room. She closed the door and leaned back against it. After a brief moment, one dark brown eye opened just a touch and looked right and then left. Her ears strained and twitched. Her lips curled up at the corners, and then as if a bee stung her on the arm, she jerked and came alive. Her arms flapped, her legs hopped and skipped, her head shook from side to side, pins flew and the thick brown locks loosened and knotted themselves together. She did not notice when the door opened behind her and Miss Summer came out, nor did she notice when the nearest room emptied and a group of sixteen year olds abandoned their stitching to come and watch her. Nor did she stop when a distant dinner bell peeled through the orphanage because at this beautiful moment Miss Lucy Anne Trotter was busy doing the happy dance of freedom. 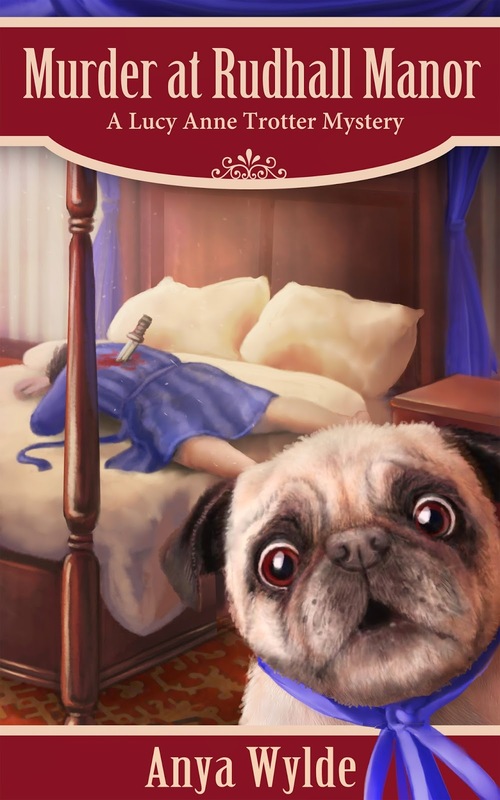 Looks like a great read; love the pug :) Thank you for the chance to win. In addition to sounding delightful, I'd love to have the book for it's cover with the wonderful dog face! But if he was stabbed in the chest, why is he shown lying on his stomach with a knife in the back? Oohhhh.... This sounds WONDERFUL! Peep #1 and I wanna read more. That dog on the book cover is just too, too cute. Happy weekend, Melissa & Truffles.